The U.S. plans to have a supercomputer by early 2018 with roughly double the performance of China's newest and most powerful system. The Chinese system, Sunway TaihuLight, was announced Monday in the latest release of the Top500, the biannual ranking of publicly known supercomputers. Sunway TaihuLight can reach a theoretical peak speed of 124.5 petaflops, and has achieved 93 petaflops on the Linpack benchmark, used by the Top500 to assess the performance of supercomputers. The latest ranking of the world's publicly disclosed supercomputers was released Monday at a supercomputing conference in Germany. The U.S. Dept. of Energy's (DOE) Oak Ridge National Laboratory is expecting an IBM system -- named Summit, capable of 200 petaflops -- in early 2018. (A petaflop equals one quadrillion floating point operations per second.) This system will use IBM Power9 and Nvidia Volta GPUs. The DOE, in a statement responding to the news Monday about China's supercomputer, said U.S. supercomputing capabilities "have grown exponentially by a factor of 300,000" since 1993. 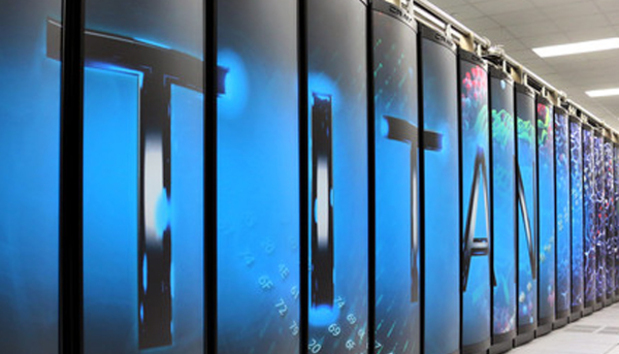 "High-performance computing remains an integral priority for the DOE," the statement said. The DOE, which buys many of the supercomputers used by the U.S. government for scientific research, has two other major supercomputers planned for 2018. One system, named Sierra, is a planned 150-petaflop IBM system that will be located at the Lawrence Livermore National Lab, and is scheduled to be available for use by mid-2018. A third supercomputer, a Cray and Intel system called Aurora, is due by late 2018, at the Argonne National Laboratory. China's latest supercomputer arrives after the U.S. banned the sale last year of Intel's high-end microprocessors to China's four main supercomputing centers. The government alleged that China was using supercomputers for nuclear testing. China has been building its own microprocessor industry, but whether the U.S. ban played a role in accelerating its processor development is a question mark. The notable aspect of China's top ranking computer is the use of its own chips, ShenWei CPUs, developed by Jiangnan Computing Research Lab in Wuxi. These chips use a RISC-based architecture, and each processor has 260 cores capable of just over 3 teraflops. The system, in total, has 10.65 million cores. The DOE said the government is "pursuing the goals of the National Strategic Computing Initiative: Accelerating the delivery of exascale computing; increasing the coherence between the technology base used for modeling and simulation and that for data analytic computing; charting a path forward to a post-Moore's Law era; and building the overall capacity and capability of an enduring national HPC ecosystem." While China may be leading the U.S. in performance for now, the American government and some analysts believe the true test of a supercomputer lies in its ability to run many different types of applications. That point was reiterated today by the DOE, which, in its statement, said the "strength of the U.S. program lies not just in hardware capability, but also in the ability to develop software that harnesses high-performance computing for real-world scientific and industrial applications." What are the biggest risks fintech poses to banks?